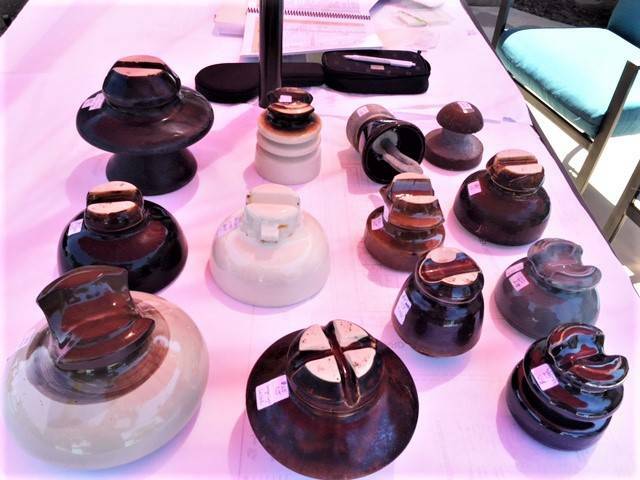 Porcelain Insulators > Sievert Porcelain Collection: Group Shot Pic 3 Many sold!!! Sievert Porcelain Collection: Group Shot Pic 3 Many sold!!! If I got any identifications wrong, please let me know so I can correct my descriptions. In the photo are a chubby hi top, U-794; a grey-green glazed Thomas cable top, U-663; a Illinoise Electric Porcelain Co., U-619; a Westinghouse marked composite insulator; a U-596, no-name Thomas pogo style insulator (SOLD); a U-529_? no-name Fred Locke (SOLD); a small porcelain suspension (SOLD); a Locke crosstop, M-2110 (SOLD); a no-name General Electric lug ear U-744; a U-799, unmarked Westinghouse hi top with a weird, grainy, toasty-like radio treatment (SOLD); U-763 Locke/ R cabletop with an unlisted cream and baby blue glaze (SOLD); U-745A no-name Pittsburg; M-2255 Thomas multipart with mismatched top and bottom glazes (SOLD).